EasyLink our goal is to provide top quality products with the best price and service support for each customer. We will do our upmost best to make you satisfied. EasyLink all in one 3D VR glasses will let you enjoy a feast of visual and audio. Equiped with Android 5.1 system, you can watch online movies, no smartphone input, no app installed. It can support wifi, bluetooth and TF card. With HD screen, you will enjoy a personal IMAX cinema in your home, without stepping out.Using polymer lithium ion battery, you can even watch for nearly 4 hours. Specifications: Cpu: Cortex A7 Multi-Core?1.3Ghz Os: Android OS 5.1 Memory: (DDR3) 1GB RAM 8GB ROM ( support TF card upto 32GB ) LCD : 5 INCH?TFT LCD 1280*720 FHD AUX : 3.5mm port USB: Micro USB2.0 BLUETOOTH: Bluetooth 4.0 NETWORK : WIFI 802.11b/g/n What's in the box: 1*3D Virtual Screen headset 1*USB Charger Cable 1*USB Cable 1*Headphone cable 1*AC Adapter 1*User Manual 1*Warranty card Contact: EasyLink our goal is to provide the best customer support for you. We are always here to help. If you have any problem with your order, pls feel free to contact us via mail or phone on Amazon as soon as possible. We will give you the best service support. Are You Excited To Experience Comfortable & Natural VR?! Virtual Reality doesn't feel real if your headset is uncomfortable or painful... That's why ROKJAM uses a virtual reality technology that includes SUPER SOFT & COMFORTABLE foam that supports your eyes as well as a design that fits naturally around your face! With this Ultra Comfortable Experience, you might forget you're wearing your VR Glasses! 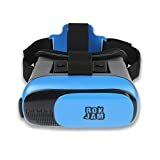 You'll Easily Focus Your Invisible Lenses In Seconds You could spend hours trying to focus the lenses of other Virtual Reality goggles...and you may still never get it 'Just Right' Your friends at ROKJAM care about your priceless time! If you want to spend less time turning confusing dials & instead start enjoying a realistic virtual reality game or movie, then we've solved your problem... You can adjust your VR lenses in as little as 10 seconds to avoid eye strain! And with a COMPLETE 360 view, you'll feel like part of your video or movie! You Can Finally See Breathtaking 3D VR That FEELS REAL! Other VR Headset brands think that a 100 degree field of view is a 360 degrees FOV... But you know that's not true. If you want a REALISTIC 3D VR Experience that takes your breath away, you need the best quality virtual reality system! ROKJAM Is That System, with a complete field of view taken up by your amazing HD VR view! What Makes ROKJAM The Best? !Super Comfortable foam inserts!Fits Naturally!Eliminates neck & eye strain!Fast & Easy lens focusing!Light as a feather!USA Company!100% Satisfaction Guarantee!Compatible with iPhone | Android | IOS | Samsung | LG | HTC & More! ROKJAM Believes You Deserve The BEST! 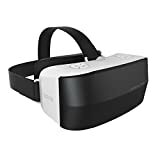 If You're Ready to experience the most natural, comfortable, easy & breathtaking 3D Virtual Reality, Click Add To Cart NOW! But HURRY! This low price is Limited...So Take Advantage of this Deal Before It's Too Late!